There are many valuable lessons to be learned by reviewing the ways companies relate to sustainability. An increasing number of companies around the world are engaging major sustainability initiatives ahead of government regulation and in the absence of strong public demand. Each company has had to deal with a unique set of circumstances and each company’s experience reveals a different insight. Here is a selection of ten companies and some of lessons that we can take from their sustainability journeys. Companies that proactively engage sustainability are rewarded while companies that ignore sustainability are punished. This holds true for Eastman Kodak, which is forced to reinvent itself by the changing marketplace. The company must radically change its product offerings and its culture of complacency or it will die. As reviewed in a Triple Pundit article, Kodak is already teetering on the brink. To raise capital, they are close to selling off some of their lucrative patents, and they have one year to submit a reorganization plan to bankruptcy court. To survive, the 120-year-old film company is morphing itself into a digital imaging company. Through its partnership with Natcore Technologies, Kodak is also investing in inexpensive patented thin-film solar technology, specifically flexible solar cells, through a New Jersey-based startup. The solar cells cost as little as half as much as traditional thin-film solar cells to manufacture. This is a bold move for Kodak, but it will need to make similar bold moves if it is to regain its foothold. Adapt or die is a motto that applies equally to thriving businesses as well. Toshiba, once a leader in incandescent lighting, is now betting on LED technology as the future of lighting. As revealed in a recent press release, Toshiba completely abandoned production of incandescent lights in March 2010 and is now diving fully invested in LED lighting. Toshiba is the first major lighting manufacturer to proactively discontinue the production of incandescent lamps. Toshiba is one of the largest lighting companies and LED light manufacturers in the world, they produced their first light bulb in 1890. On July 13, 2011, Toshiba announced that twenty of its energy-efficient LED lights have received the US Environmental Protection Agency (EPA) Energy Star® label. An Energy Star qualified LED lamp uses up to 75% less energy, lasts at least 15 times longer than incandescent lighting and has a light quality, which remains consistent over time. Being awarded the Energy Star certification is an important payoff for Toshiba’s bold strategy. LG Electronics USA is based in Englewood Cliffs, N.J., and it is the North American subsidiary of LG Electronics, Inc., a $49 billion global force and technology leader. LG Electronics Inc. is reducing emissions by collaborating with government. As reviewed in an April 3, 2012 PR Newswire release, LG Electronics USA plans to cut its carbon footprint in half by 2020. To help achieve this ambitious objective, the company is working in cooperation with the EPA’s Green Power Partnership, which is a voluntary clean energy program. As part of the Partnership, LG USA will power its Englewood headquarters by purchasing more than 1.5 million kilowatt-hours (kWh) of green power over the next 18 months. This translates to carbon emissions reductions equivalent to more than 200 passenger vehicles per year, or more than 100 average American homes annually. In addition to their partnership with the U.S. EPA, LG is also part of South Korea’s Green Technology Center (GTC), a research institute that will focus on developing environmentally friendly technologies. As reviewed in an Ecoleader article, Samsung has a green vision that will only get greener in the future. Like LG, Samsung is also part of South Korea’s Green Technology Center (GTC) research center and the company is already a leader in energy-efficient products. In 2007, Samsung was first with internet connected appliances to increase energy savings and reduce costs, and in 2008, Samsung launched an eco-phone made with corn-based bioplastics. In 2011, the company launched more Green IT products and services and in the summer of 2011, Samsung joined the Climate Savers Computing Initiative (CSCI). Samsung will continue to innovate by increasing energy efficiency, reducing CO2 emissions and being less harmful to the environment when its products are recycled or disposed. As reported in GreenBiz, the parent company of some of the world’s biggest luxury and sporting brands, including Gucci, Yves Saint Laurent, and PUMA, are embarking on one of the world’s most ambitious green accounting programs. PPR Home has announced that it will adopt a group environmental profit and loss statement (EP&L) by 2015. This new approach to accounting will help to monitor and manage greenhouse gas emissions, water use, pollution, and land use change. According to PUMA executive chairman, Jochen Zeitz, EP&Ls are superior to conventional sustainability reports. The EP&L provide a more transparent view of the supply chain. PUMA’s E P&L revealed that 94 percent of its environmental impact was created in the supply chain, which has encouraged the company to find alternative materials to reduce that impact. Zeitz said that the company was looking into requiring firms to measure and report their environmental impact when PUMA is selecting suppliers in future. According to an article by Carol Baroudi, HP and Dell are each taking different approaches to sustainability. HP is emphasizing removing toxic compounds from manufacturing while Dell is focused on recycling through take back programs. HP has been far better than Dell at removing toxic compounds from their designs. They have reduced PVC and BFRs, and they have completely phased out beryllium and other compounds. Greenbiz has lauded Unilever’s efforts if for no other reason than the sheer scale of its sustainability ambitions. By 2020, the company, with annual revenues exceeding $63 billion, plans to cut its massive environmental footprint in half through its Sustainable Living Plan. Unilever’s Sustainable Living Plan articulates the view that business must prepare itself for a future in which resources are rare and more expensive. You do not need to be a multi-billion dollar company to develop innovative approaches to address sustainability challenges. One such concern involves securing qualified employees. ARAMARK has launched an Environmental Internship Program designed to meet the growing need for employees who have a practical understanding of environmental initiatives plus fundamental business knowledge. The program provides young professionals with corporate experience and creates an awareness of the role environmental stewardship can play in all jobs. ARAMARK is a world leader in professional services, providing award-winning food services, facilities management, and uniform and career apparel to health care institutions, universities and school districts, stadiums and arenas, and businesses around the world. Green is also growing in the building sector. As reported in the Daily Herald Business Ledger, the green market was 2 percent of non-residential construction starts in 2005; 12 percent in 2008; and grew to 28-35 percent in 2010. By 2015, an estimated 40-48 percent of new non-residential construction will be green. Experts say green building will support 7.9 million U.S. jobs and pump $554 million into the U.S. economy over the next four years. By 2015, the green share of the largest non-residential retrofit and renovation activity will more than triple, growing to 25-33 percent of the activity by value — a $14-18 billion opportunity in major construction projects alone, industry experts say. When Brian Berg Sr. established Berg Engineering Consultants Ltd. (BEC), there was no green market and there was no LEED certification. However, when he set up shop in the midst of the 70s energy crisis, he paid heed to prevailing conditions and positioned himself to be ahead of the curve in energy-efficient designs. Now his firm has won numerous energy awards using energy efficient design in a huge and growing market. Bottom line benefits are driving the adoption of sustainability. As Sara Pax, President of Bluehorse Associates, noted, it is ‘not about tree-hugging’: Sustainability is simply good for business. According to Pax, companies should be concerned about their environmental sustainability – but it has more to do with ensuring profitability than it does with saving the planet. Bluehorse Associates is the maker of a tool for measuring environmental sustainability for the food industry called Carbonostics, which Pax claims can give food and beverage companies tangible information about which measures make most sense for business, as well as for the environment. Consumer engagement should not be a top priority for companies, Pax said, as only a very small percentage of consumers change their purchasing decisions based on any environmental work that a company has undertaken. 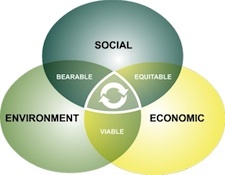 Businesses are drawn to sustainability by the returns they see in the real world experience of other businesses. Research bears out the hypothesis that businesses that adopt a sustainable culture “significantly outperform their counterparts over the long-term, both in terms of stock market and accounting performance.” This was the finding in a November 2011 study conducted by researchers at Harvard Business School and London Business School. Business is doing more for the environment than governments or grass roots populism. We can learn a great deal from the sustainability journeys of the brave pioneers who have dared to lead.